The carding process for worsted yarn production is intended to disentangle and lay them as parallel as possible. The fibres are passed between rollers covered with fine wire teeth. Since worsted yarns, however, should be smooth, the fibers are made to lie as parallel as this process will permit. Following this operation, the wool goes to the gilling and combing processes. Gilling is carried out before (preparative gilling) and after (finisher gilling) combing. The preparative gilling is mainly to align the fibers in a parallel direction, further blend the wool through doubling and to add moisture and lubricants. Whereas finisher gilling is mainly aimed to remove the mild entanglement introduced to the combed sliver. The carded wool, which is to be made into worsted yarn, is put through gilling and combing operations. The gilling process removes the shorter staple and straightens the longer fibers. This process is continued in the combing operation, which removes the shorter fibers of 1 to 4 inch (25 – 100 mm) lengths (called combing noils), places the longer fibers (called tops) as parallel as possible, and further cleans the fibers by removing any remaining loose impurities. Drawing is an advanced operation which doubles and redoubles slivers of wool fibers. The process draws, drafts, twists, and winds the stock, making the slivers more compact and thinning them into slubbers. Drawing is done only for worsted process. This is the final stage before spinning. Roving is actually a light twisting operation to hold the thin slubbers intact. Mule-spun yarns generally are superior to ring-spun yarns but they tend to be much more expensive due to the slow production rates and high labor input. Worsted yarns are spun on any kind of spinning machine – mule, ring, cap, or flyer. The two principle systems of spinning worsted yarns are the English system and the French system. In the English system (Bradford), the fiber is oiled before combing, and a tight twist is inserted. This produces smoother and finer yarns. The more tightly twisted yarn makes stronger, more durable fabrics. In the French system, no oil is used. The yarn is given no twist; it is fuzzier, and therefore suitable for soft worsted yarns. The objective of carding process is to disentangle the fibers. In this process the wool fibers are passed between rollers covered with thousands of fine wire teeth. The wool fibers are disentangled by the action of the wires and are arranged in parallel fashion. This makes the woolen yarns smooth. 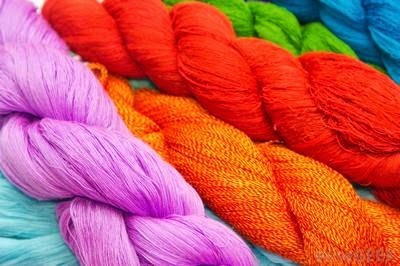 Since the production of woolen yarns is intended to be rough or fuzzy, it is not desirable to have the fibers too parallel. By use of an oscillating device, one thin film, or sliver, of wool is placed diagonally and overlapping another sliver to give a crisscross effect to the fibers. This process helps in obtaining a fuzzy surface on the yarn. The next stage is spinning which is similar to that of worsted production process. We would learn the spinning process is the next section.